I have a hard time walking past purple poppy mallow when I’ve got my camera in hand. I have plenty of photos of the flower already, and I’m not sure there are many angles I haven’t explored (see last week’s post). But it’s so darn attractive! This week I began noticing how many of the flowers had crab spiders lurking around on them. 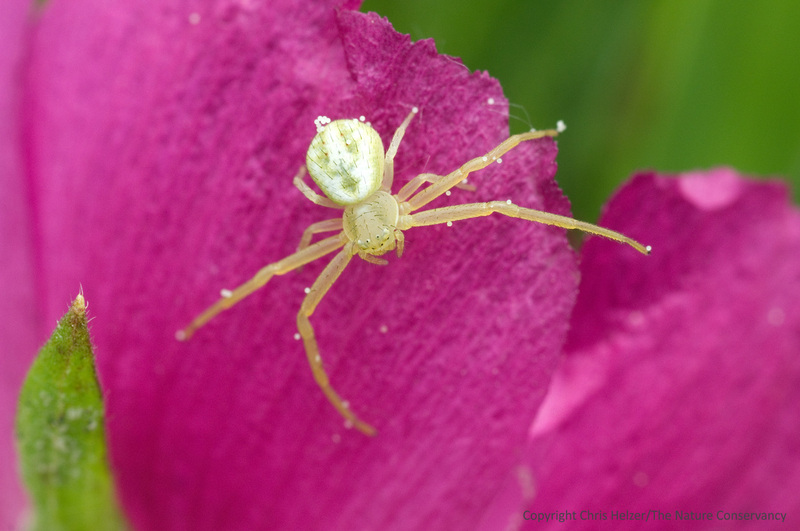 Although some crab spider species can change colors from white to yellow and back, that ability doesn’t do much to help spiders sitting on bright magenta flowers… Regardless, there they were – maybe one per 10 flowers I looked at. Crab spider on purple poppy mallow. Platte River Prairies, Nebraska. If you’re interested, you can read more about crab spiders in my NEBRASKAland magazine article here: CrabSpider-July2009 and about spiders in general in another article here:Spiders-AugSept2010. This entry was posted in General, Prairie Insects, Prairie Management, Prairie Natural History, Prairie Photography and tagged close-up photography, crab spider, invertebrate, macro photography, nature photography, poppy mallow, prairie, spider, wildflower by Chris Helzer. Bookmark the permalink. Very patient to set up a tripod, I shoot all my bugs hand held. How big are those spiders? Is this at 1:1? They’re about 1/2 inch from leg tip to leg tip. It’s pretty close to 1:1… Shot with a 100mm Macro lens about as close as I could get. Tripod was necessary here – it was a little breezy and it was all I could do to figure out how to get it sharp WITH the tripod, let alone worrying about my camera moving too! That was so smart, but it makes me feel so stupid! I have had the same problem and didn’t think of your solution. I’m a sucker for spiders and good light. A little dew or mist helps. Shots like this seem to me to have much easier on film, but I haven’t used film for several years now and Kodachrome extinct for what seems like decades. Nice composition, and both a patient photographer and a patient spider. “There they were – maybe one per 10 flowers I looked at.” And often there’s spider silk on the other nine!